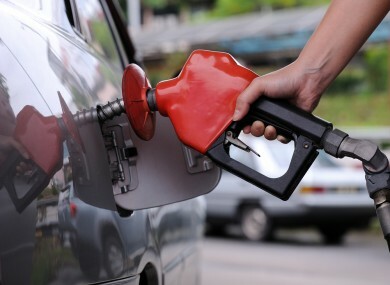 MOTORISTS CAN EXPECT some good news when filling up their car later this year. AA Ireland has said that the “signs are good” for a few cent to be shaved off the cost. However, if a difference is really to be felt at the pumps, the Government needs to step in and consider reducing the tax on petrol and diesel in Budget 2015, the AA’s director of consumer affairs Conor Faughnan said. He told this website that “the ingredients are there for a slight fall”. For the price of fuel to come down, the price of oil must as well, which it’s doing now, although it’s not as big a factor as many people might think. Faughnan noted that there may be an oversupply of petrol and diesel coming out of refineries. This is because the summer periods are seen as a time of increased activity, with the ‘gasoline season’ in the United States where motorists take to the roads in their thousands. “This was relatively subdued this year,” Faughnan said. The other thing is that the economics of some of the giants in Europe such as France, Italy, and Germany were also subdued. However, he noted that tax adds 58% of the cost of a litre of petrol is tax. “If the Government really wants to help, not just motorists, but every Irish family in terms of their costs of living, they could drop the tax,” Faulker said. The Government has shied away from increasing excise duty on fuel in recent Budgets. Email “Expect (some) good news at the fuel pumps later this year”. Feedback on “Expect (some) good news at the fuel pumps later this year”.